nah, no pack but costs 30k from scratch and the cheapest 89 is 50k. can link to 85 zlatan for a bit of chem. usually the 86+ teams only need 50-60 chem. always can have a few players on none. Annoying the Howard SBC is MLS and it's not a Flashback, but fully worth it none the less. Going into my PL team despite no chemistry! All between 16-17k and all gone, justvinder a mill profit mate so nice one. You had between 300-400 of these cards? Very quiet here, thankfully I still held onto my otw cards. What are the ceiling for the 81 otw that have risen to 27k? Depends on which 81 it is, Richarlison for example will probably get a winter upgrade so I think he’ll rise. Mmmm interesting, today EA lowered all German informs price ranges by 15-20k. also i think it's worth doing cech for 100k. you get a 91 rated card and 80k worth of packs. Nah nowhere near enough interest in the league SBC unfortunately. If they were going to skyrocket they would have already done so. They should update that SBC with 2 bricks at CB. 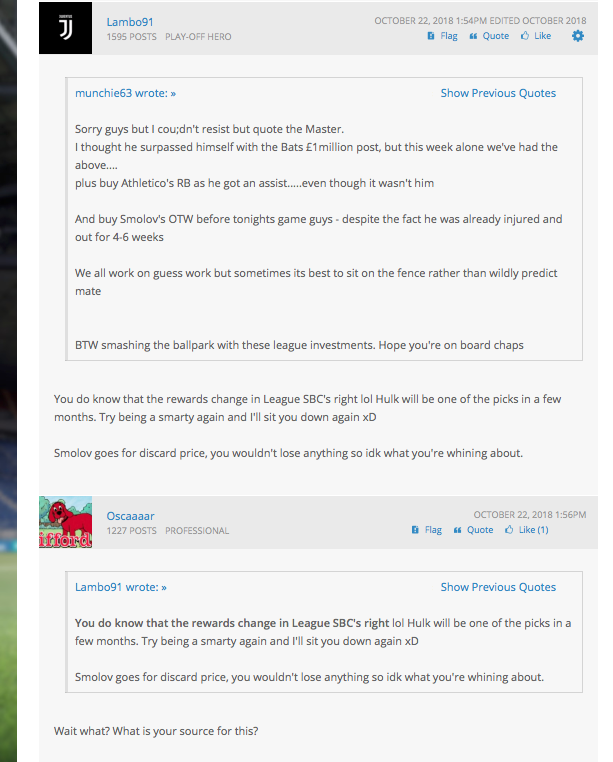 You mightn't have seen but they've already have upped the price ranges, they're anywhere from 25-35k and still extinct. That tells me the issue isn't their price, but their supply which is clearly insufficient for how many people want to get Dumfries. @Zv1k0's suggestion is roughly what EA really need to do. They've changed SBC requirements before - if they're unable to brick slot, just simply change the requirements to 9 Utrecht players / 11 Eredivisie players which is what we've seen in other league SBCs in the past. a few japanese players went to 80-100k price range increase last year! Yeah I do remember that Albirex or whatever it was, madness. There was a Brazilian CAM who went up to 60-70k at one stage, and you didn't even need him in the SBC. yeah, pretty vague memory of it but when i came to completing it i had something like 3 spare. the CAM a RB and another. i'm not against playing games / getting loyalty though (i think people forget that). you could get loyalty on benevento and sell an extra CB for 30k as well last year. i'm sure there were lots of others too. Wow 81-86 upgrade looks decent? Bpm and 2k max / sbc for a 81+ gold card. Ill take it. Absolutely worth it. Gonna be a big week of spamming BPM, as you say it's roughly 1.5k plus bronzes, which you can keep replenishing through bronze packs. Well well well I shut the doubters yet again. 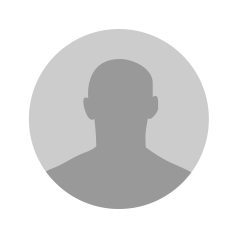 League SBC's for Premier League and EFL League SBC's players has been added. I wasn't exactly on point but I saw where it was going and nobody believed it. 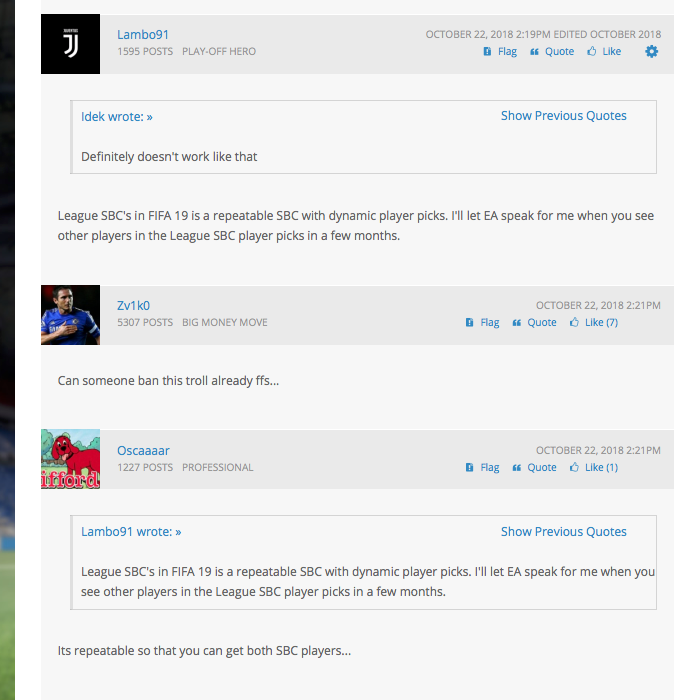 I've been saying each League SBC's will have different players from the player pick down the line when the first 2 League SBC's came out when we learned that they're player picks and look at them now adding players for the League SBC's. Hulk for the Chinese League will be added so prepare your chinese league players if you haven't already. Everything is pure speculation. This whole entire thread is pure speculation. None of us know exactly what EA will do unless they announce it, otherwise nothing is for certain. Sometimes we get things right, sometimes we don't. The point of this thread is to help everybody make coins through investing and being efficient utilising SBCs, not about who happened to be right about something they said 3 months ago - that didn't make anybody any coins. As soon as they released the first 2 League SBC's we learned that they're player picks and repeatable. 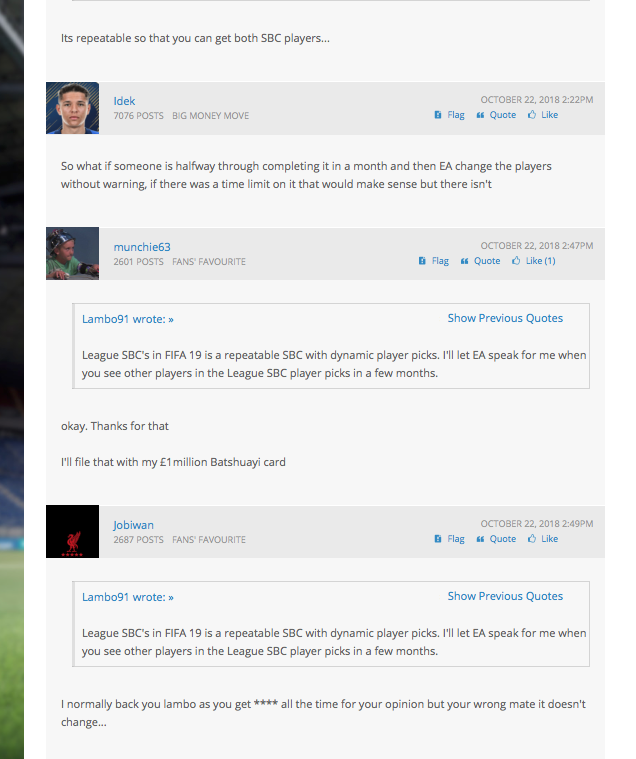 I started saying FIFA 19's League SBC's will be dynamic because they're player picks and repeatable in October, a month after the game is released. I took what EA released and put my educated conclusion on it and nobody believed it. I happened to be right. There's no speculation. 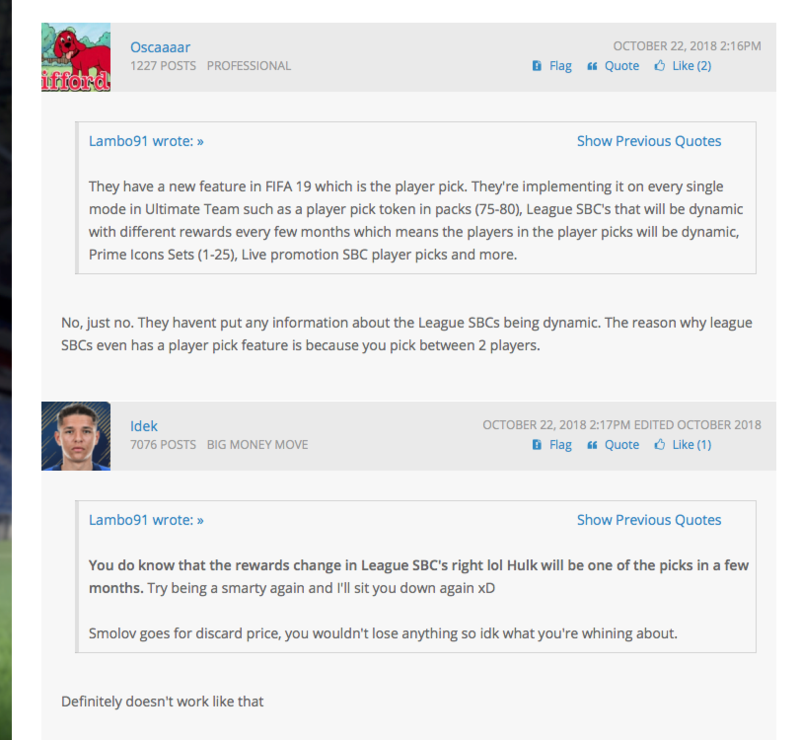 I just made sense of the first league sbc idea they put out for FIFA 19 which is a player pick league sbc and making it repeatable so I put an educated conclusion on it because it made sense but clearly nobody wanted to believe it. An opinion is an opinion. Take it and leave it. Don't bash someone's opinion. You can simply move on if you don't like the opinion but clearly nobody wanted to move on and started quoting me and attacking me. Same goes to you Stevie G, you don't like my opinion then don't quote me or talk about me. Move on and be on topic. Don't give me that "Back on topic" and continue saying what you wanted to say. When you quote or talk about me me I'll quote back.